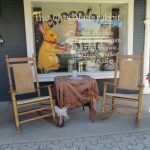 Sometimes when I’m on the road, I find the most interesting places within the smallest little villages. 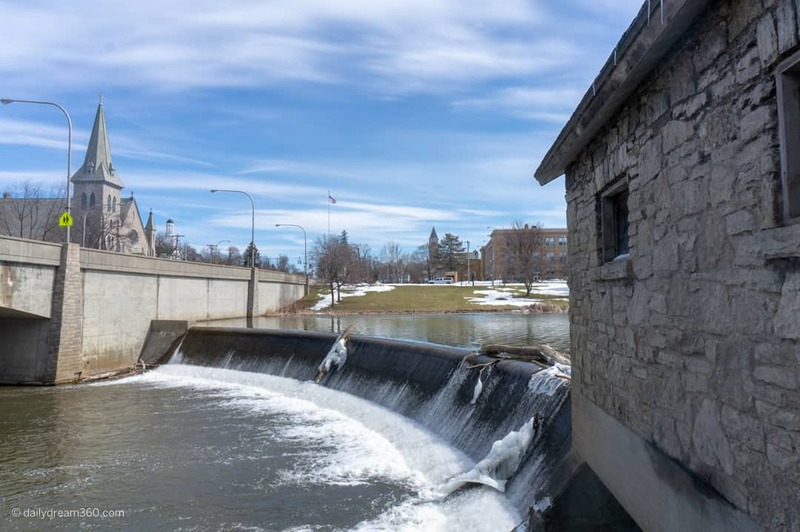 On a girls getaway of upstate New York, after passing Williamsville, we made our way up to the town of Leroy in Genesee County New York. 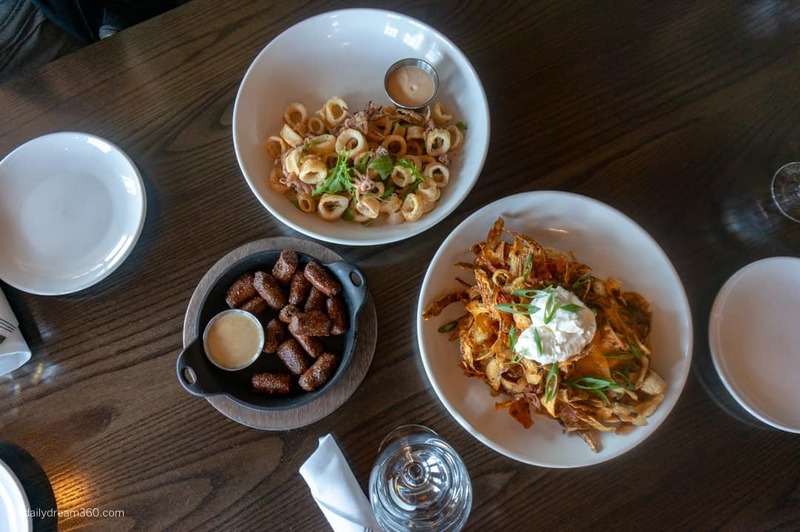 Farmers Creekside Tavern and Inn was our first stop on our Rochester Girls Getaway, and when we returned for another road trip in the area, we knew we had to stay there. 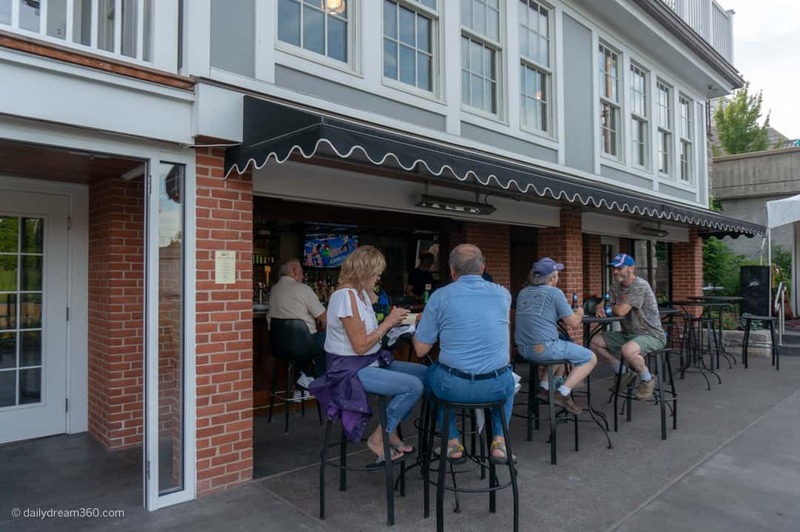 Located in Genesee County in the town of LeRoy, NY, Farmer’s Creekside Tavern and Inn features an upscale restaurant and bar with 3 boutique rooms on its top floor. 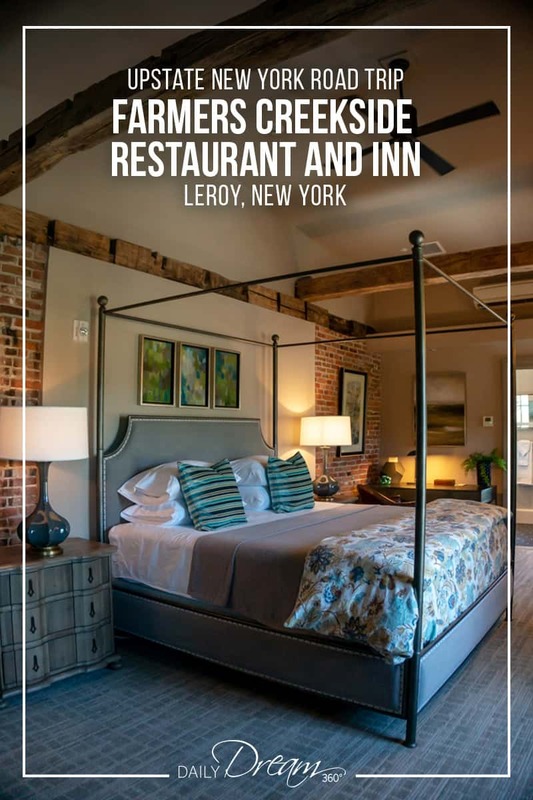 If you are visiting the Greater Niagara Region (or Western New York), or on route to the Finger Lakes, LeRoy is not a bad spot to stop in. 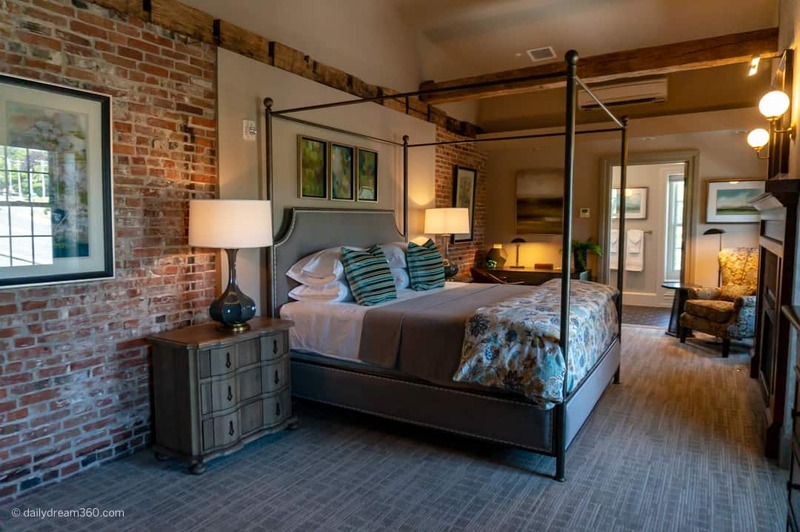 The wood flooring, exposed brick walls and of course the windows by the rushing waters of the river outside all make for a spectacular vibe. 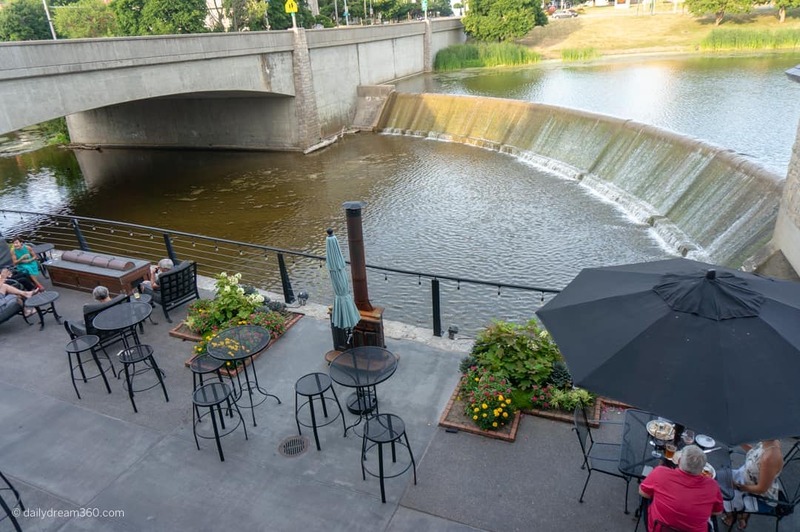 The first time I visited it was the first week of spring and the snow had not all melted yet, but I imagined drinks on the patio as live music played and local brews were served. 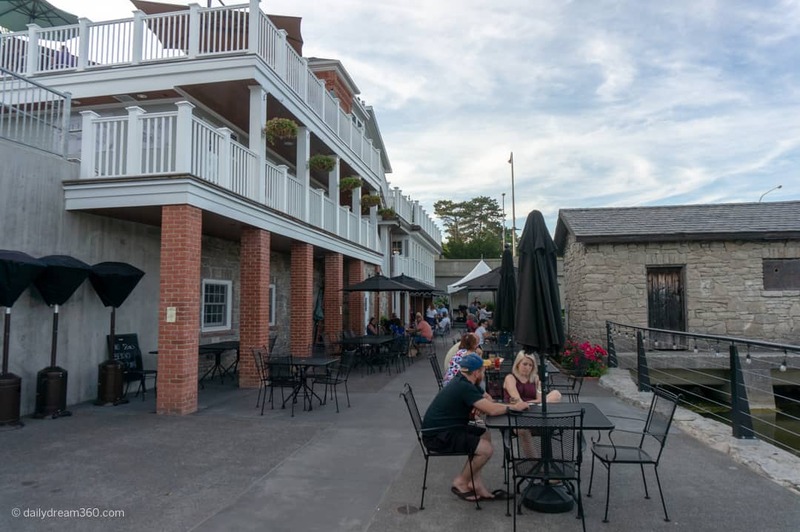 Then during the summer, I found myself on the patio, during sunset as live music played and everything I imagined during my first visit came to life. The Sommelier has an impressive list of wines both from local wineries and a selection from around the world. The staff serving the wine are as excited and educated about it as if they are the Sommeliers themselves. They know just what to offer you, even if you are not sure what you want. 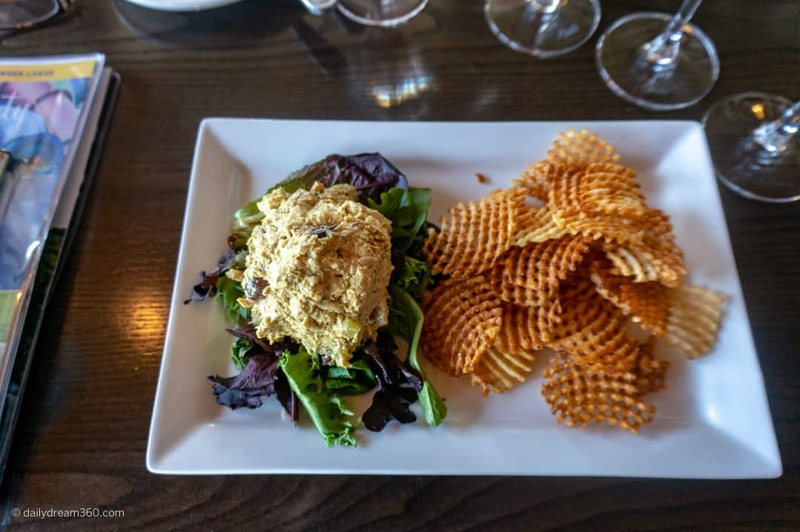 They offer suggestions and complimentary pairings with total confidence, and it made me fall in love with the restaurant even more. 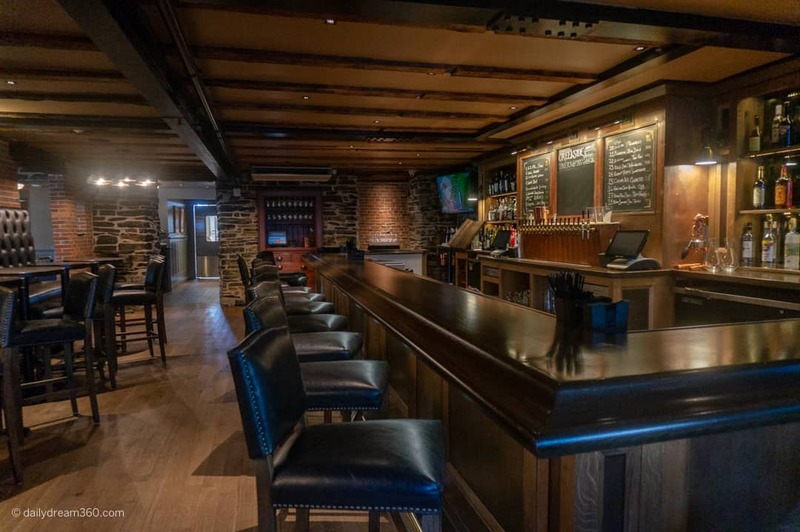 As far as taverns go this is more of an upscale restaurant and menu with a higher price point. The chef has some interesting takes on pub favourites and we sampled a few them during our first lunch visit. 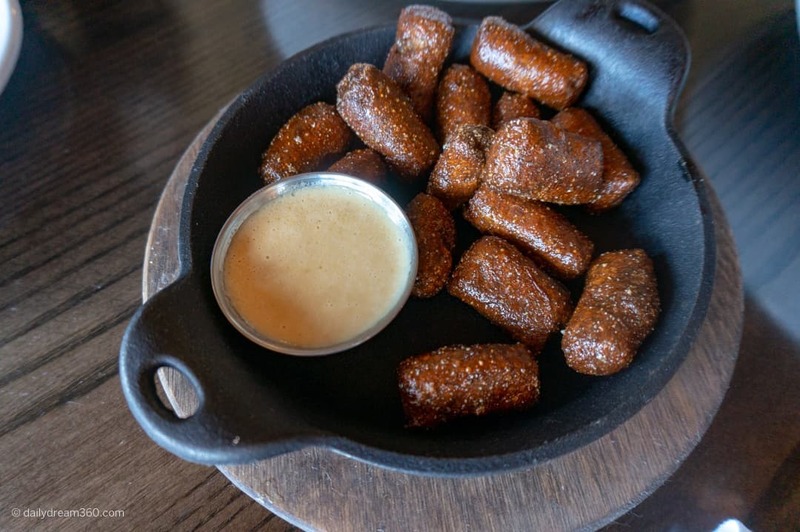 “PNOCCHI”: is a pretzel-like Gnocchi served with beer cheese. Potato Skins: Imagine nachos made with potato skins and you have this pretty addictive plate. 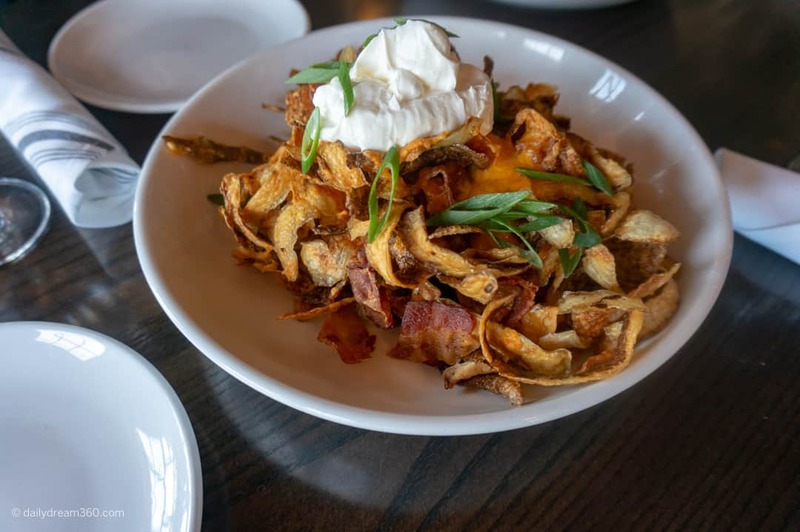 Bacon and cheese topped potato skins all sitting under a dollop of sour crème. Just delicious. 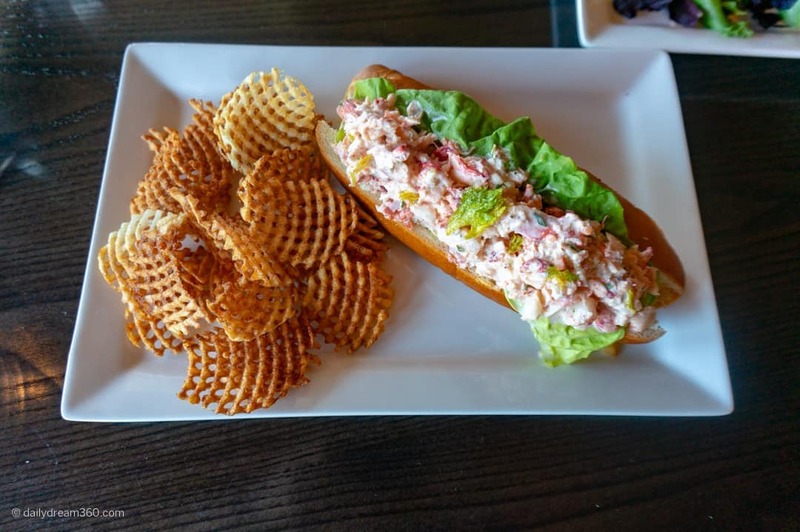 Lobster Roll: This delicious sandwich is served with waffle fries and the roll is filled with delicious chunks of Lobster. Burger 1: I saw one burger from the menu and it made me sad I didn’t order it for myself. These burgers are big and served with waffle fries. 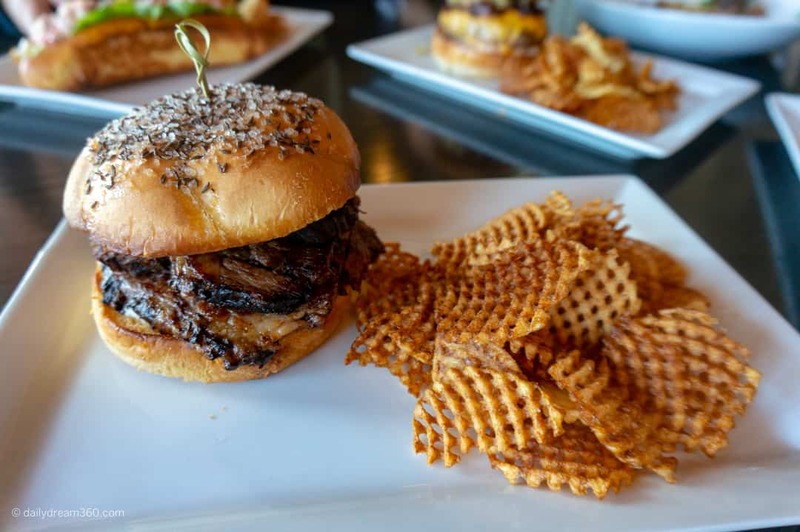 Beef on Weck: When in the Buffalo region someone at the table will order Beef on Weck and this is Farmer’s Creekside Tavern’s take on this delicious sandwich. At lunch, I asked for a healthier take on a chicken salad sandwich. I ended up getting waffle fries with a dome of curry chicken salad. The chicken was great, but I would not describe this as a healthy substitution. During our second visit and stay at the Inn, we had dinner on the patio. 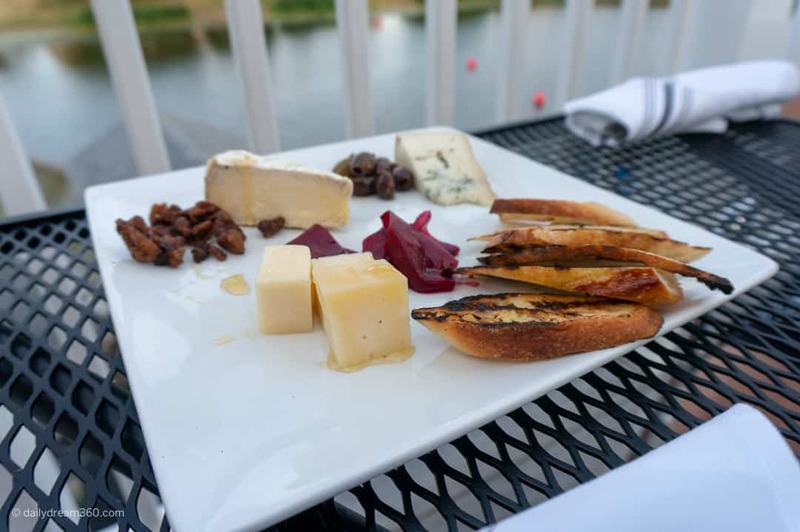 The dinner menu included some bar bites and nibbles, appetizers and a variety of main dishes. We started our evening with a Local Cheese Board, and I leaned on our waitress to offer her enthusiastic wine pairing. She did not disappoint. Substitutions seem to be an issue. I don’t know why, but again there seemed to be a hiccup when it came to making substitutions. Both times I came to the restaurant I asked for a low carb, no sugar option. 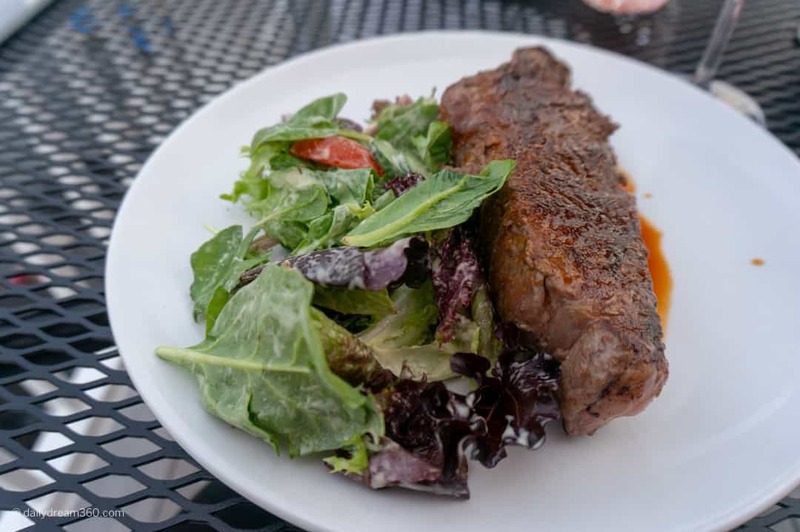 I wanted my steak with just vegetables, but no starch vegetables and they were not able to accommodate this request, so they just substituted a garden salad instead. In my opinion, both the lunch and dinner menus are limited as far as healthy options. 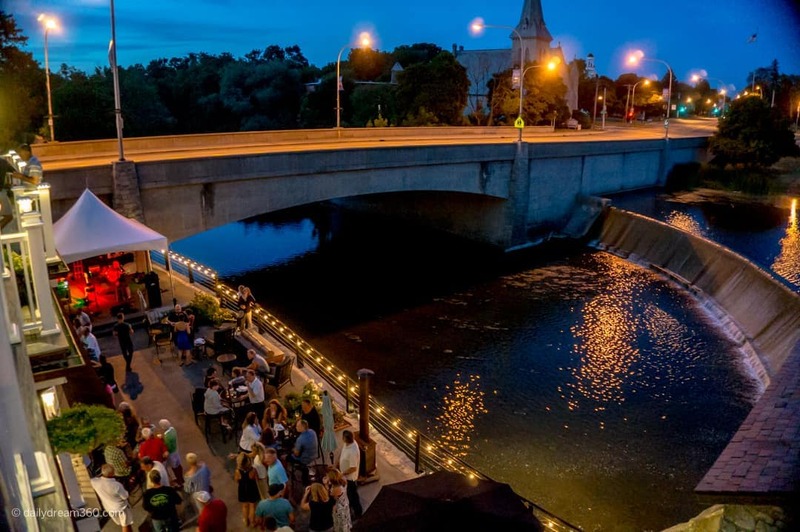 Farmers Creekside has a lovely bar located on the lowest floor with a patio along the side of the river. 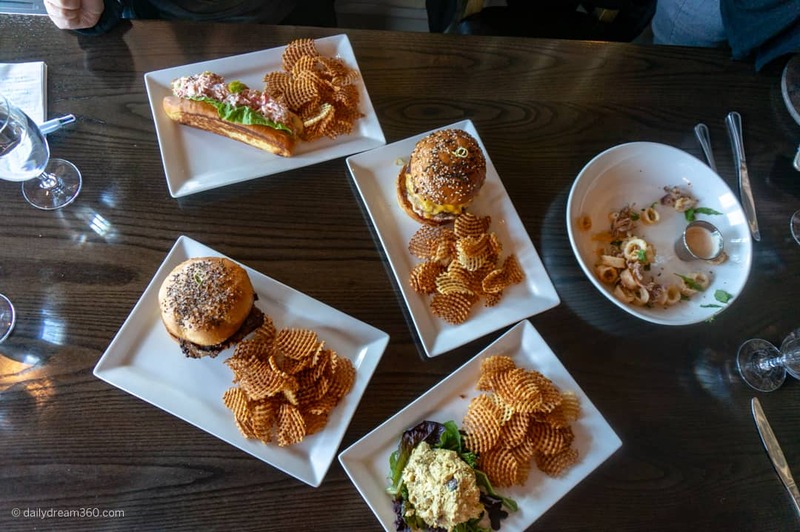 It is very lively and offers a menu of bar bites (including the appetizers featured above) and a variety of beers on tap. On the weekends they have live bands playing making this a favourite local hotspot. 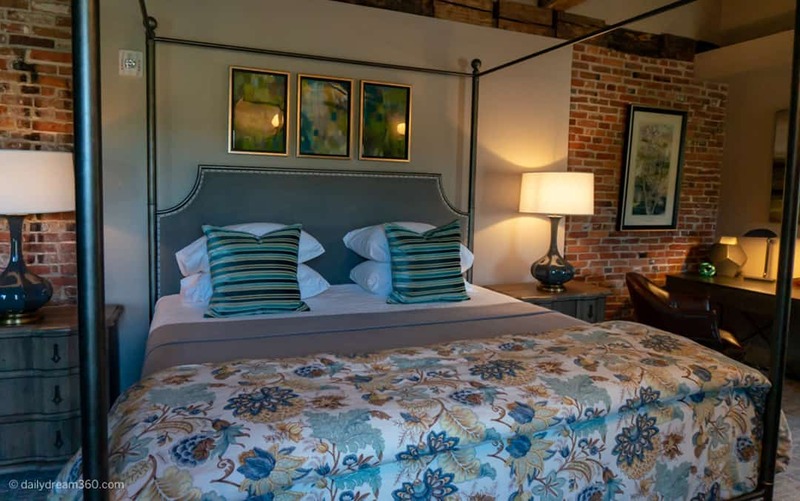 There are three rooms at the Farmers Creekside Inn and each one was as inviting as the other. We arrived at the Creekside mid-afternoon for check-in. During check-in, we were told to make a reservation for dinner but didn’t get much information about the Inn part of the restaurant. 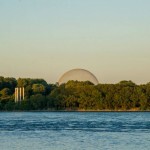 A better orientation as to the procedures and the relationship with the restaurant and inn would have been helpful. There is nowhere to lounge inside or grab a coffee when you are staying here. 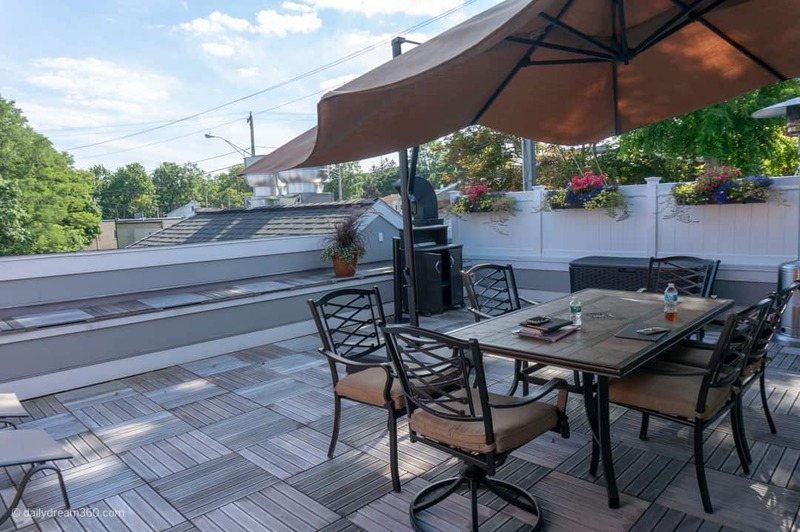 There is a sundeck which is a private patio for the three suites which has a few sun chairs and a table and a large retractable umbrella to hide away from the shade. In order to get food or drink here, you will have to walk downstairs to the restaurant and place the order there. You also can not just bill the restaurant purchases to your room they are both handled separately. My room was suite number 1, and this spacious room became our place to sit and lounge until the sun moved and it cooled down on the deck. Just a note this is an Inn above a restaurant so you may hear noise from both inside the restaurant below you and on the patio outside. If you plan to stay here on the weekends check ahead if there is live music playing at the lower bar to avoid further disruptions. 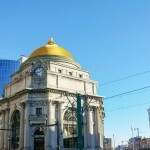 If you are a music lover and plan to stay at the bar late to enjoy the music, then there is no issue, but if you want to go to bed earlier one of the other two rooms will be better on nights when music is playing. The room is spacious and has a large King bed, an armchair, desk, and tonnes of drawers and closet space. 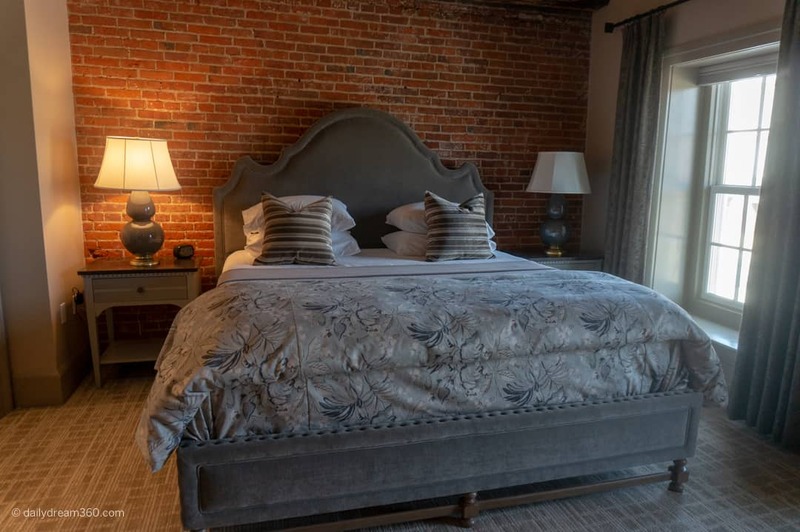 Probably more storage space than you would ever need for a 1-2 night stay at the Inn. The bathroom was spacious and had two sinks. 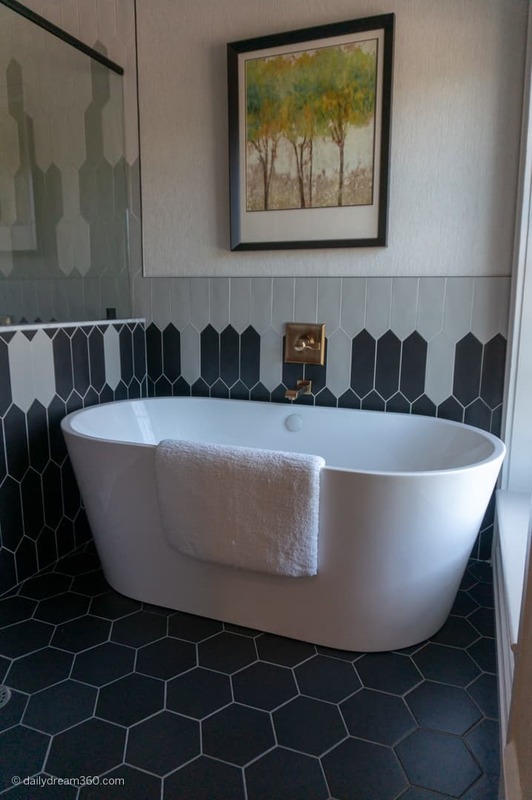 There was a large soaker tub but no bath gel or bath salts in the toiletries provided to do a proper soak. There was a large walk-in shower in the bathroom with some fancy handheld shower and a rain shower head. There is also a panel for the heated floors located behind the door near the toilet. 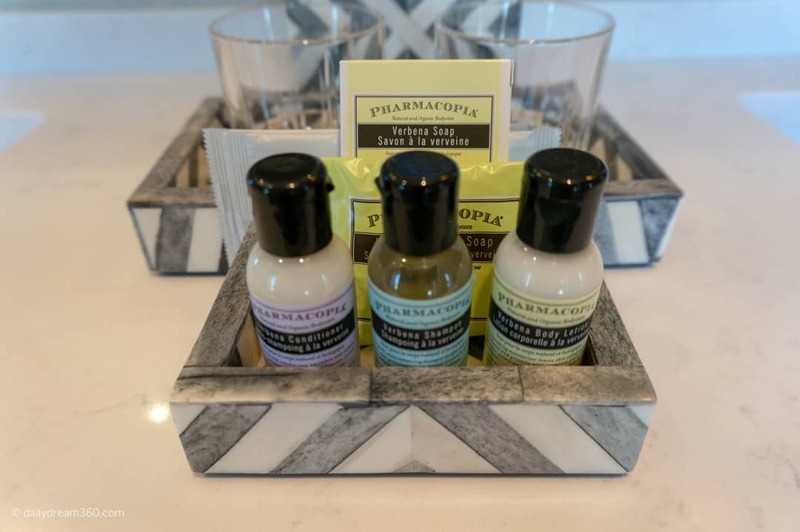 Toiletries in the room were from Pharmacopia. There was one soap, facial soap, lotion, shampoo and conditioner. There were also two make up remover wipe packs. 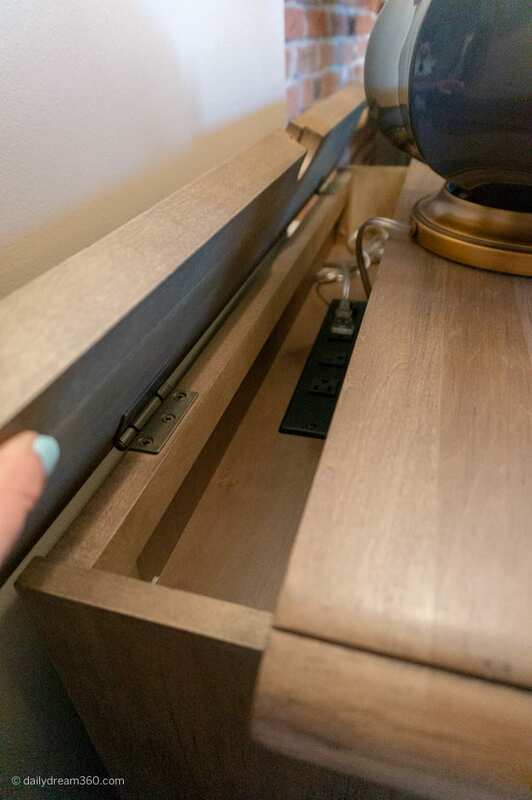 Hidden hookups: At first, I wandered around the room concerned about the location of all the plugs, but I found that both nightstands had a panel that when opened revealed several plugs for bedside charging of your technology. The desk, however, had only one accessible plug in it, on the wall below the table. It was awkward to get to; they could use a plug unit on top of the desk. There is no phone in the room which was awkward. If you need something, there was no one to call you have to make your way down two flights of stairs to ask someone at the restaurant for help. It was great to get two small bottles of water in the room that sat nicely next to the ice bucket but we were not given instructions as to where to get ice. At dinner, the hostess at the restaurant explained the relationship between the Inn and the Restaurant better. You can take your ice bucket down two flights of stairs to the restaurant and one of the staff members will fill it up for you. 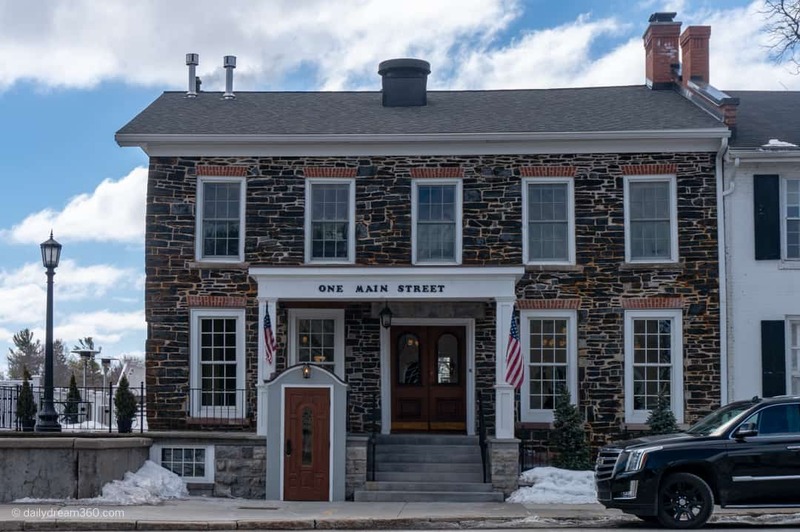 If you want to order coffee, a drink or some food you will also have to make your way down to the restaurant to do this, and you can not bill the room or run a tab, the bill has to be settled at the restaurant which is separate from the inn. 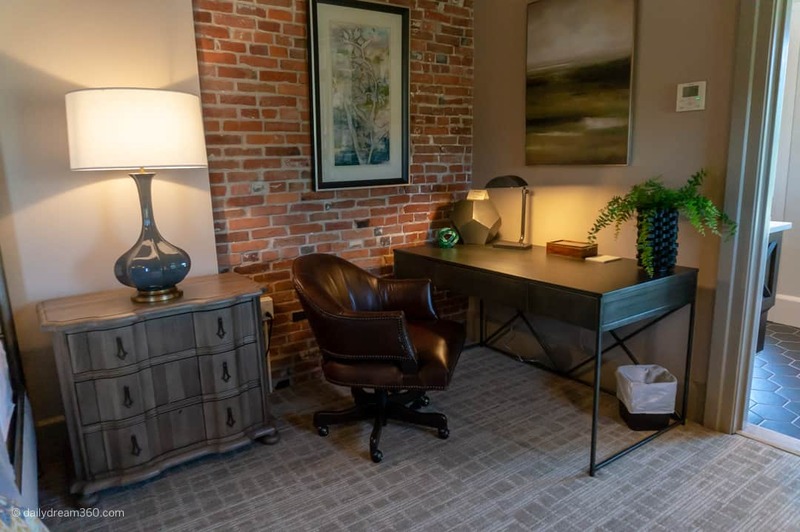 Suite 1 is located along the creek and has a lovely view of the falls. During dinner, I could hear some noise from the tavern when people were on the patio below me. There was a private party which sat right under my window between 6:30 and 7:00 but it wasn’t too bad. Again a radio would have drowned out this noise. After 6:00 during the dinner hour there was a live band playing at the bar level. We were told by the general manager that the band stops playing at 10:30 PM which I thought was reasonable. We headed to our rooms by 10:00 and it was actually not bad at first. The band had stopped playing, and the noise and music from the bar were not too loud at all. However, the band came back on at 10:25 and played well past midnight. With the live band, it is very noisy. As I suggested if you are not a music fan this is not the room for you on nights when there is a live band. Even with earplugs, I could hear the music, so I got no sleep before midnight on Friday, and we had an early morning the next day. I did do a site visit, so I got a look into the other rooms at the Inn. They are smaller than the suite I stayed in, but their location might be better for those not participating in the live music shows. The second room was much smaller, and its windows sat on the private deck which is only accessible to the suite guests. It had a Queen size bed and a smaller bathroom with shower only. My friend stayed in this room, and she noted some restaurant noise as they moved tables around, but she could not hear the loud music from the band playing. 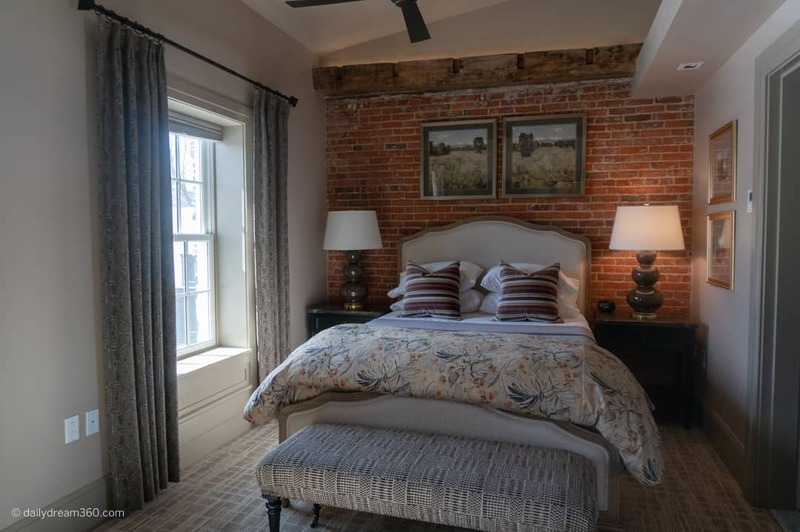 This suite is about the same size as Suite 2 and overlooks Main Street. The decor was similar to the other rooms but with green accents. Not sure if the noise from the patio is as prevalent here since it is facing the main street. A small continental breakfast is available for those who stay in the suites. A tray is left in the main hall with some pastries, yogurt and coffee. 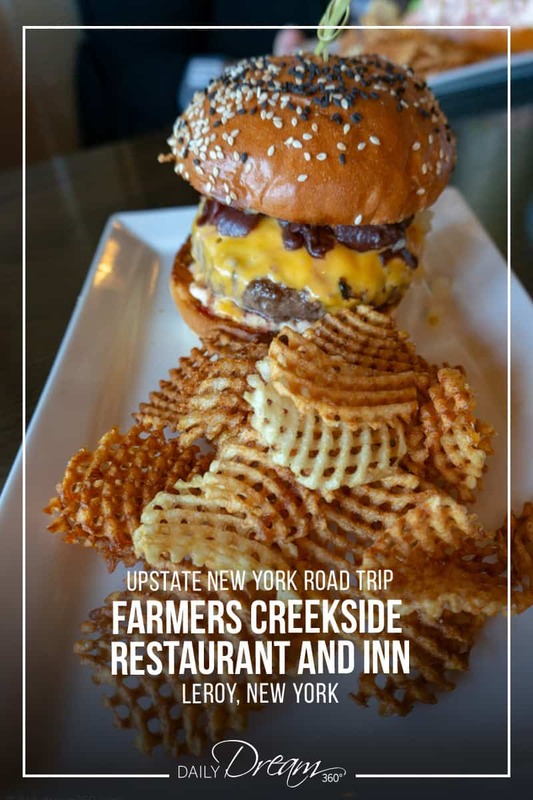 Disclosure: I visited the Farmer’s Creekside Tavern, and Inn on two separate press trips through the region. 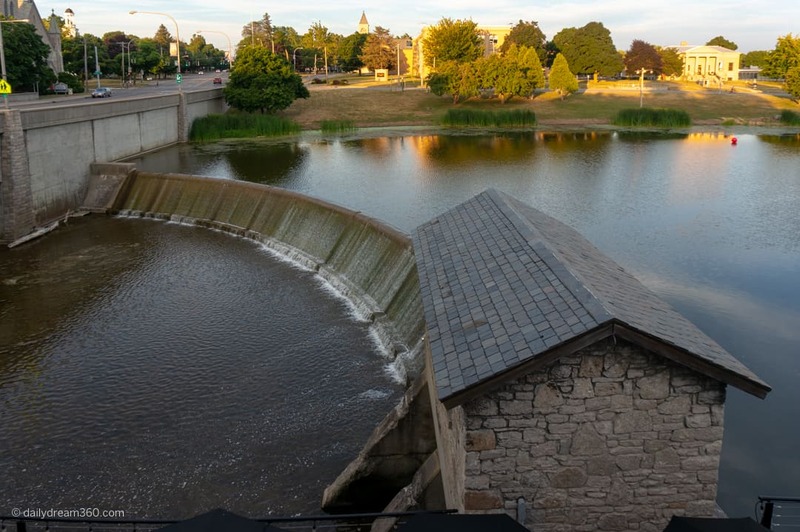 Travel Assistance provided by Genesee County and Farmer’s Creekside Tavern and Inn. Opinions in this post are my own based on personal experience.